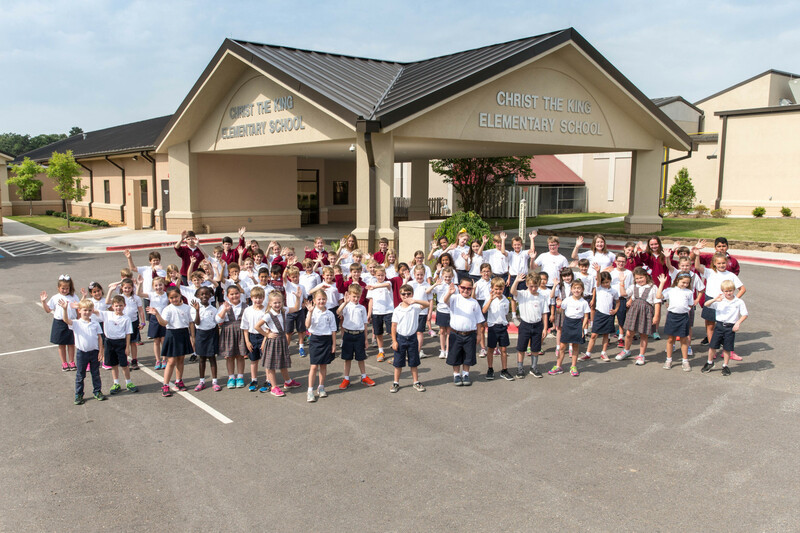 Christ the King School opened with 200 students. There were two classes of Kindergarten through 3rd grade, one 4th grade class and a combined 5th and 6th grade class. The faculty consisted of 10 teachers, a librarian, a secretary and a principal. The original building consisted of 11 classrooms, a media center, an administrative area and a teacher work area. An art room, computer lab, and 12 more classrooms were added to the unfinished upstairs portion of the original building. A Jr. High wing was added. It consisted of 6 classrooms, a fully-equipped science lab, a computer center an assistant principal's office and a conference room. A state-of-the-art gymnasium complex was completed. The 2nd floor of the gymnasium was restructured and now serves as a large art room. Also in 1998, the library was expanded to twice is original size. Christ the King purchased the Ministries Building in 2004. The building now houses our Pre-Kindergarten, Eckert Center, meeting rooms and multiple administrative offices. A state-of-the-art Safe Room that holds over 820 people was constructed. New administrative offices were added. The former office area was reconstructed to a Spanish classroom and Learning Assistance Center.